Bloomberg Washington Editor Al Hunt appeared on the web-only section of Sunday's This Week and dismissed the idea that the Tea Party movement has broad appeal. He derided, "They love Glenn Beck and they're skeptical of John McCain. That's not America." Hunt's comments pivoted off of remarks from the conservative George Will, who pointed to a new Rasmussen poll showing Americans more in line with the thinking of the tea partiers than Barack Obama. Hunt scoffed, "They are angry, conservative, little bit more upper-income Republicans...I don't think they're closer to the country, George, than Barack Obama." Former Wall Street Journal editor Al Hunt (now with Bloomberg News) expressed grave pessimism about the Democrats on PBS’s Charlie Rose show Wednesday night, to the point where he said they need to jam through a health bill, or lose the House. AL HUNT: They’re going to have to persuade the House to pass the Senate bill...you have to persuade some liberals to swallow hard. I spoke to Nancy Pelosi today. The votes are not in there in the House today. That`s the job of Barack Obama and Rahm Emanuel. DAVID BROOKS: That`s not the message though I heard from the speech. I heard the "Let's go gently into the good night." HUNT: If that happens, David, I guarantee the Republicans will win the House of Representatives. BROOKS: But he didn`t say "We’re close. Let`s just jam it through." He said "Let`s begin again, let`s hear some ideas." 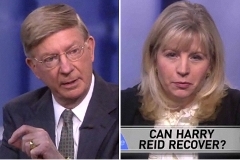 A somewhat surprising debate occurred Sunday when conservatives George Will and Liz Cheney took different sides of the Harry Reid racist remark issue. Appearing on the Roundtable segment of ABC's "This Week," the former Vice President's daughter said, "[O]ne of the things that makes the American people frustrated is when they see time and time again liberals excusing racism from other liberals." 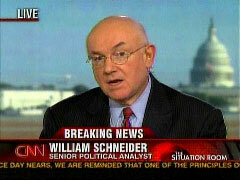 Will, after shaking his head, replied, "I don't think there's a scintilla of racism in what Harry Reid said. At long last, Harry Reid has said something that no one can disagree with, and he gets in trouble for it." George Will on Sunday accused the media of manufacturing the return of government mandated healthcare to the current reform debate. 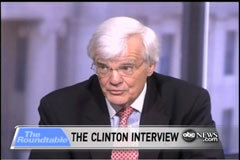 Discussing the subject on the recent installment of ABC's "This Week," Will said it was highly unlikely Democrats actually have the votes for what they call a "public option," but the media are assisting them in "cleverly and skillfully manufacturing a sense of inevitability that they hope will be self-fulfilling." 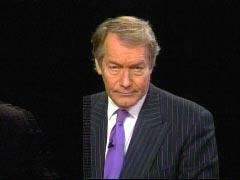 The Charlie Rose show on PBS was a natural place to get the warmest, most exaggerated praise for Ted Kennedy on the night after his death was announced, on August 26. 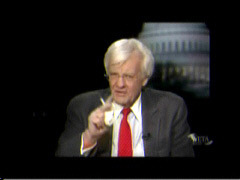 Many liberal media outlets have reported the Kennedy Center birthday party Sunday night for Sen. Ted Kennedy. Few have mentioned the media turnout. Al Hunt of Bloomberg News, the former Executive Washington Editor of the Wall Street Journal, joined Caroline Kennedy in awarding Sen. Kennedy the Kennedy Library’s "Profile in Courage" Award. Frank Mankiewicz, the former president of National Public Radio and Robert F.
Barack Obama's overseas trip this past week proved “he's not a left-wing ideologue” or a “dove” and, “if anything, he's center, even center-right, on foreign policy issues,” Bloomberg News world affairs columnist Fred Kempe, a veteran of the Wall Street Journal, declared on this weekend's Political Capital show which airs several times Friday night and Saturday on Bloomberg TV.